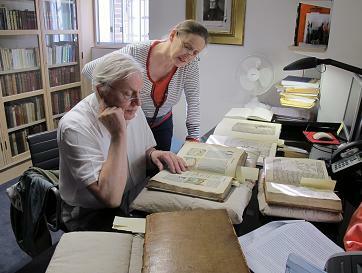 Following on from Sir Quentin Blake’s visit on 4 October, the Incunabula Project Team was delighted yesterday to welcome Sir David Attenborough and his daughter Susan to the Library. Sir David will be one of the contributors to our forthcoming treasures book, writing up Cambridge University Library’s copy of the Hortus sanitatis, printed in Mainz by Jacob Meydenbach, 23 June 1491 (Inc.3.A.1.8). The Hortus sanitatis, or the Garden of Health, is a vade mecum of all things natural, herbal, medicinal and mythical. Illustrated throughout with woocuts, hand-coloured in the University Library copy, it draws its source material from the classical authors, from ancient histories, medieval bestiaries and a long and rich tradition of fable and folklore. The result is a potent encyclopaedic mixture of the real and the imaginary. 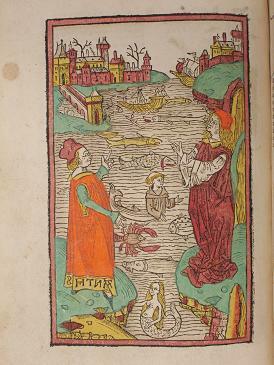 Each book is introduced with a full-page illustration, representing a variety of scenes depicting physicians, disputing scholars and apothecaries in a variety of naturalistic settings: two scholars surrounded by birds outside a town wall; two physicians on the banks of a river with fish and mermaids; four physicians inspecting urine flasks in an apothecary’s shop. There are a further 1,100 column-width illustrations of herbs, plants, animals and human activities within the text, making the Hortus sanitatis a feast for the eye. The animal section is typical, describing, depicting and conflating a vast array of mythical and real animals. 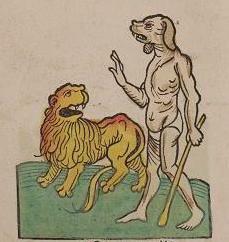 Tridents, unicorns, basilisks and dog-headed men are described alongside dogs, giraffes, lions, camels and crabs. From the medieval bestiary come stories of the phoenix, of the formless nature of new-born bear cubs, licked into shape by their parents, and the story of the pelican, pecking its breast to feed its young with its own blood. Sir David spent a long and enjoyable afternoon leafing through the book and the Project Team looks forward to his contribution. ← Unknown stamp from Augsburg: Query solved.